Dear Readers, there is nothing that sounds more like summer to me than the drowsy buzz of bees feeding from California lilac. It seems to attract everything from bumblebees to honeybees to hoverflies, and although its rather dusty, resinous smell makes my nose tingle I still always stop to see who is visiting. Apparently there is a species of California lilac which smells so strongly that it resembles ‘boiling honey in an enclosed space’. I think I shall give that one a miss. The masses of tiny flowers soon lose their petals, resulting in a puddle of blue at the base of the plant.The resultant seeds are said to be dependent on forest fires in order to germinate, so it sounds as if self-seeding won’t be a problem unless you’re prone to having bonfires close to the shrub. 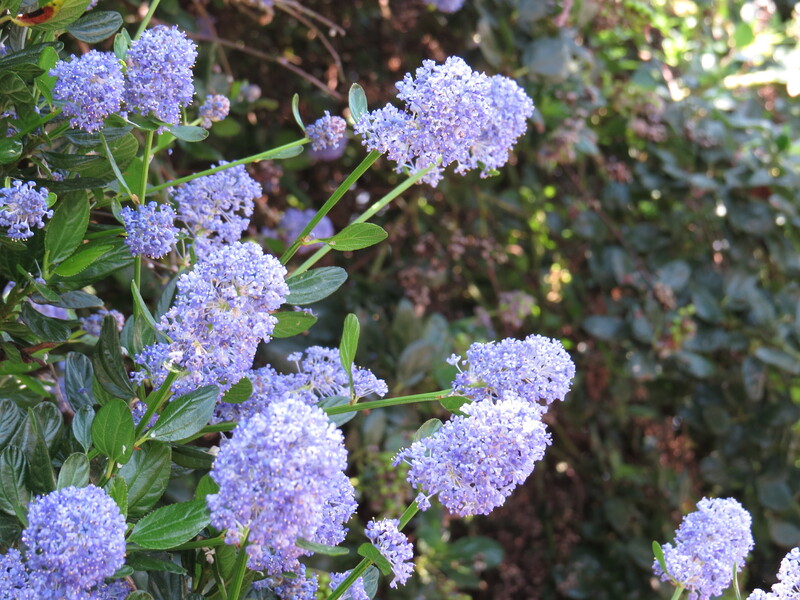 California lilac comes in many shades of blue, from what my grandmother used to call ‘Royal Blue’ to the most delicate powdery robin’s egg shade. It is extremely popular in the County Roads here in East Finchley, where it has grown to about eight feet tall. Most varieties are evergreen, and there is even a more recumbent plant that could be used for ground cover. 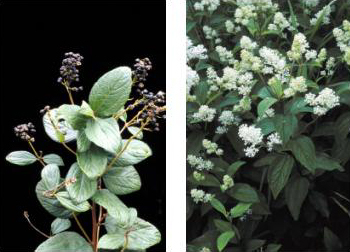 There are 50-60 species in the Ceanothus genus, which is part of the buckthorn family. The genus is an endemic to North America, with its epicentre in, as the name suggests, California. 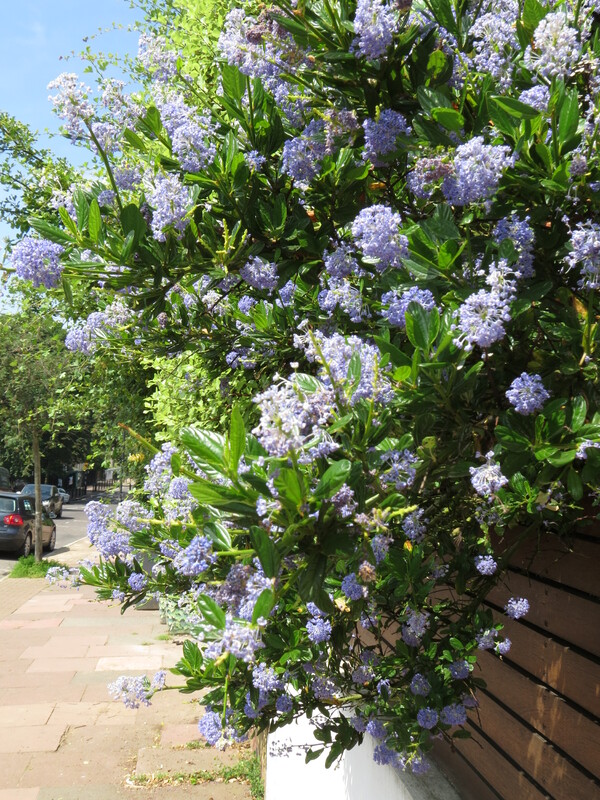 The name ‘Ceanothus’ means ‘spiny plant’, which is surprising as, as far as I know, this is a most inoffensive plant. Do let me know if it’s attacked you at any point. I suspect that the small trees in my area are examples of the ‘domesticated’ form of Ceanothus arboreus, but there are many hybrids around. I am wondering whether to pop one into my tiny front garden, to fill the gap between the bulbs and the lavender. I shall be engaged in pondering as I write. Incidentally, Ceanothus has nitrogen-fixing nodules on its roots, which makes it good for the soil. One species of Ceanothus, Ceanothus americanus, is known as ‘New Jersey tea’ because its leaves were used as a tea substitute during the American Revolution. As the plant is very high in tannin this is not as surprising as we might think. In their native North America, Ceanothus leaves are eaten by mule deer, and the stems and seeds are eaten by quail and porcupine. 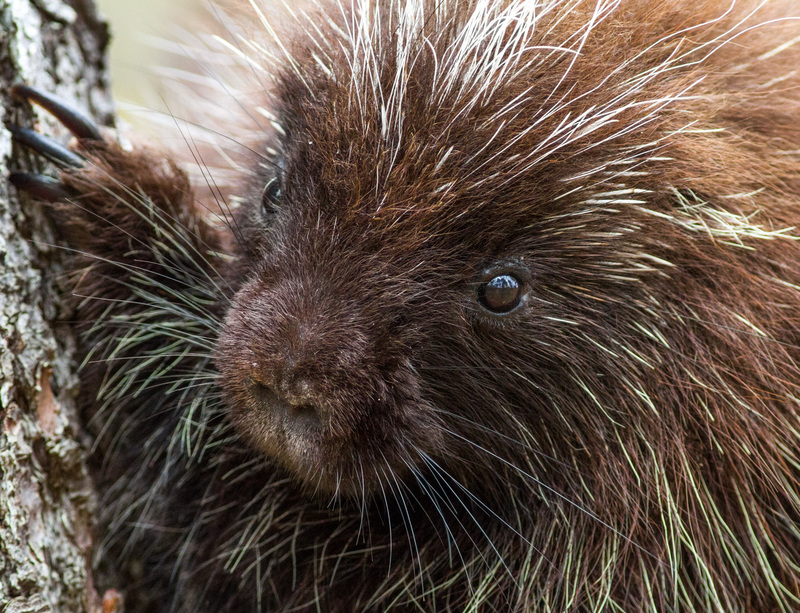 And so here, for your delectation, is a North American porcupine. You’re welcome. In its native North America, Ceanothus has had a variety of uses. Those fluffy blue flowers are saponins, which means that they can be used as a soap substitute if crushed and mixed with water.This ‘soap’ was used by the women of some Native American tribes to perfume their skin before their marriage ceremony. The roots produce a red dye (one alternative name for some varieties of Ceanothus is ‘red-root’). The flowers produce a green dye. Unsurprisingly, using the whole plant gives you a brown dye. Medicinally, the roots were dried and used as a decoction to treat sore throats and all manner of bronchial ailments, from asthma to bronchitis. The plant was also used as a wash to treat sores and skin complaints. One theme that crops up repeatedly when I read about Ceanothus is that it is short-lived. I wonder if the climate in the UK stresses these Californians, what with our heavy downpours, brief periods of hot sunshine and unexpected cold snaps. At any rate, it certainly stresses me. I also wonder if any plant that blossoms so prolifically, year after year, can keep going for a long time. After all, trees such as beech and oak flower and set fruit intermittently rather than constantly generous. Just as the Ceanothus in bloom reminds me that it’s summer, so do the banners outside the Royal Academy announcing that it’s time for the Summer Exhibition (which opens to the public on 12th June). For those of you who are unfamiliar with this event, it’s an opportunity for artists to have their work hung in the halls of the Royal Academy. The vast majority of the works are also for sale, with prices varying from under a hundred pounds to many thousands. Among the eager newcomers will be the new works of the Academicians, artists who have made it to become Fellows of the Royal Academy. 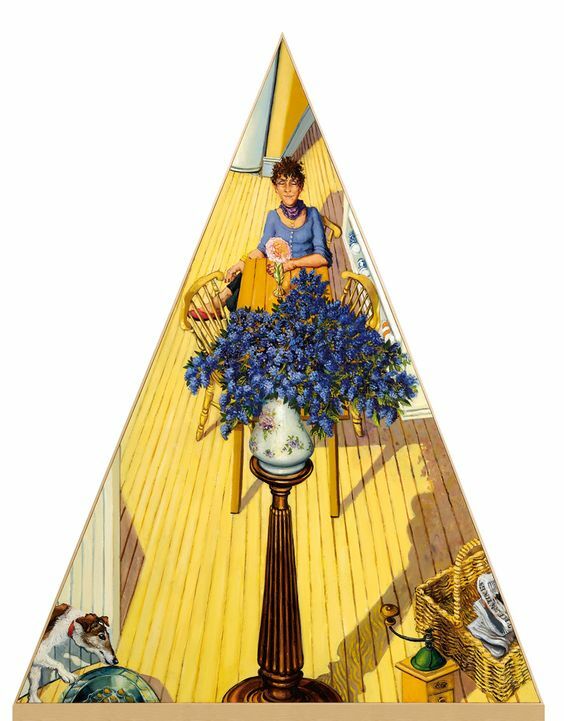 One of the most interesting is Anthony Green, who presents scenes from the most unlikely angles. Conveniently, he has created one of a vase of Ceanothus, and if you have £16,500 hanging about I’d advise you to buy it sharpish. For more of his paintings, which manage to be both familiar and otherworldly, have a look here. I find them most intriguing. 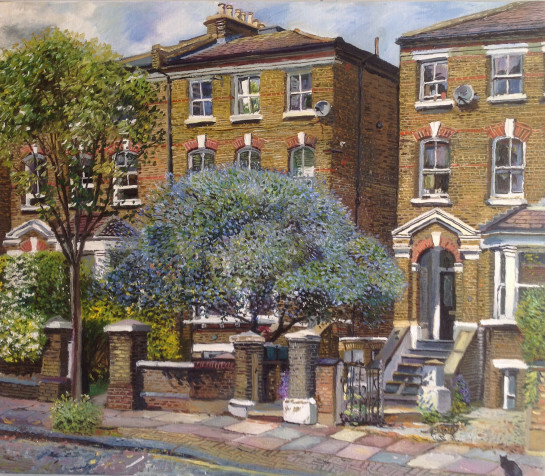 I am also rather partial to this painting, ‘Ceanothus tree in a London street’ by Melissa Scott-MIller, who says ‘Who am I to edit nature? It looks beautiful enough as it is’. This image just sums up the unexpected pleasures to be had in walking London’s residential streets. The painting was at the Affordable Art Fair, and you can read more about it here. If you’d like to look at some of the artist’s other paintings (and I admit to having fallen in love) her website is here. And to finish this post with something unexpected, here is a Ceanothus silk moth (Hyalophora euryalus), whose larvae feed on the leaves of our Wednesday Weed. 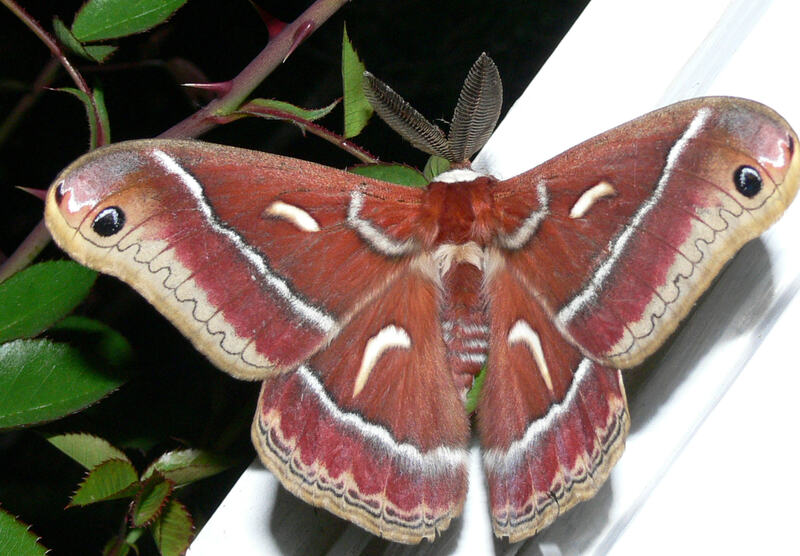 This huge moth can be found all the way from British Columbia to Baja California, and has a maximum wingspan of 127mm. The adults do not feed, but spend all their short lives looking for a mate and laying eggs. The caterpillar goes through a variety of colour changes, but is never anything short of spectacular. I love the way that the eyespots make it look as if the moth has a couple of snakes for protection. This entry was posted in London Plants on June 13, 2018 by Bug Woman. Another wonderful post and thanks for including the links to those two artists – one very unusual and one quite amazing how she’s captured the detail. Oh glad you liked it. I love finding new artists. I love all varieties of Ceanothus. The one at the edge of my front garden – ‘Trewithen Blue’, I think – is at its best right now. I’ve found that some varieties grow very large very quickly, and this one is currently trying to take over the pavement! 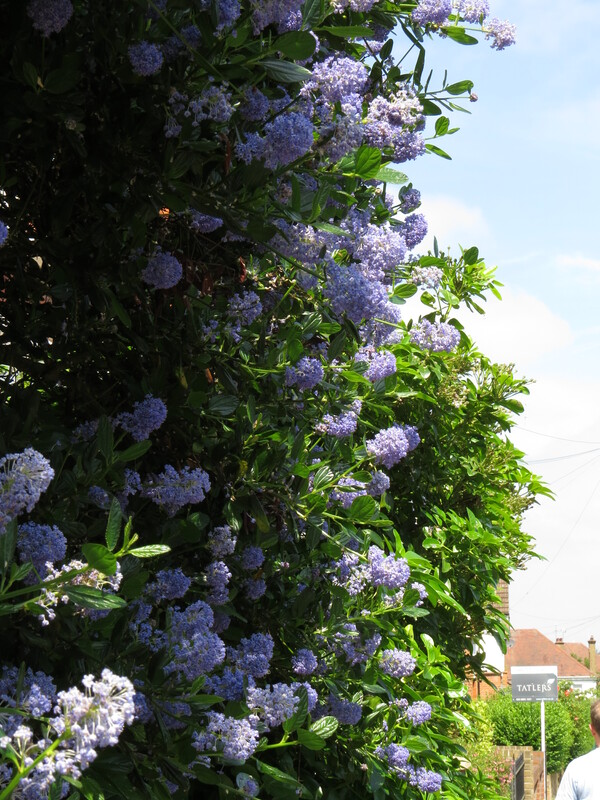 It’s sad that Ceanothus is so short-lived – I do miss the majestic specimen in my back garden which I loved to look at from my bedroom window – but it hasn’t put me off planting more. Most of the wild ceanothus are different from the garden varieties. The buckbrush has pale white bloom and small prickly leaves, like tiny holly leaves but not quite as prickly. The fragrance is nice though. I am not familiar with a ceanothus that smells like honey in an enclosed space. All ceanothus are short lived, even in ideal situations. Many of our native specie are like that. Old tree like ceanothus rarely last twenty years. Some of the ground cover types last only about ten years. Although they regenerate more vigorously after fire, they are not dependent on fire. 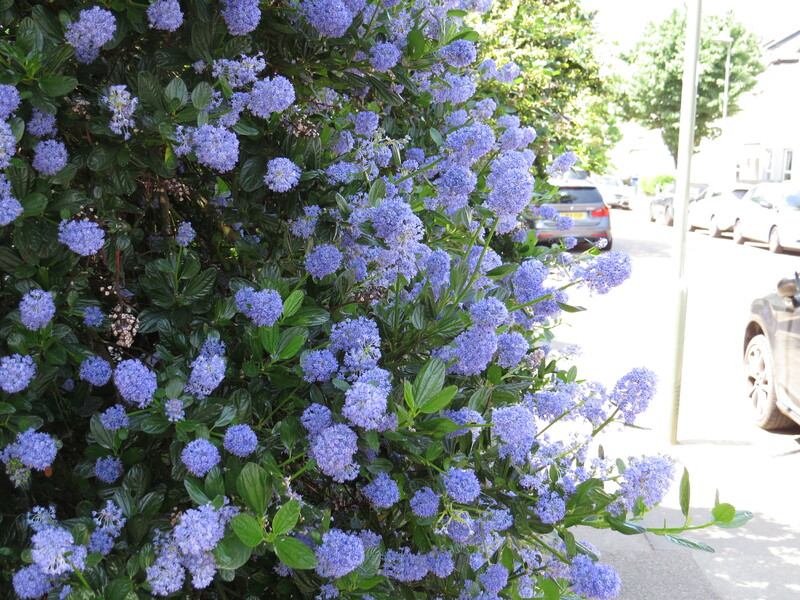 My neighborhood has not burned in more than sixty years, but ceanothus do quite well. Ceanothus is not easy to work with in confined spaces. It does not like to be pruned. 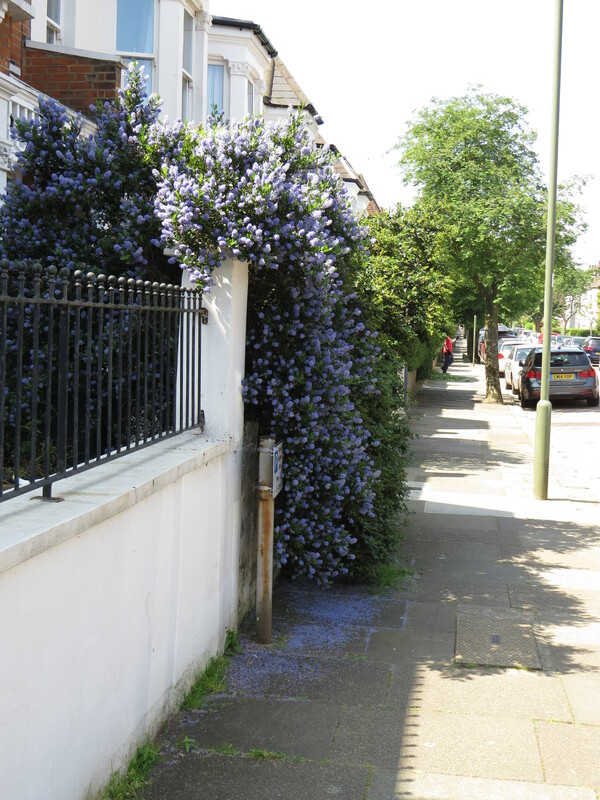 Tree like ceanothus can be pruned up for clearance by removing lower limbs completely. However, they do not do well with shearing. When ground cover types must be pruned at a curb or sidewalk, the pruned edge never recovers. They tend to pile up on themselves, which makes pruning even more difficult. I was unaware that there were quite so many varieties! I do like them a lot. They seem to be very useful too. That moth is gorgeous and its caterpillar is spectacular!